The ritual initiation in the Candomblé is a process of constructing a permanent psychological identity between the participant of the cult and the cultuated entity. Opposing to the mediumistic development on the spiritist conception – in which the spiritist medium temporarily renounces its proper subjectivity in favor of the subjectivity of a deceasead person - the incorporation trance in the Candomble has as main objective the reciprocal self-recognition between the ‘santo' (saint - the entity) and its `filho' (son - the devotee), the symbolic and permanent reconnection between the world of men (Ayé) and the world of gods (Orum). This process of symbolic identification between the participants and the Orishas does not exist only at the privileged moment of the ritualistic trance; the identity between the initiate and its saint corresponds to the permanent incorporation of the orisha’s psychological characteristics in the personality of its ‘children’. This identity is not only settled through the initiation - slowly and gradually developing during the trance, but it is also periodically strengthened in the successive and renewed obligations on the public parties of the saints, when all the present community becomes a witness and guarantor of this alliance, and get benefits from it. The Candomble rituals consist basically on a set of archtypical themes - the representation\ incorporation of forces of nature personified in behaviors and stories – one following the other during the ceremony. 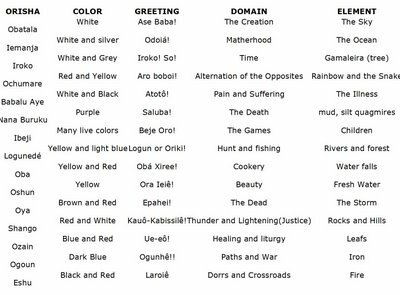 Each entity is manifested through a characteristical trance, produced by specific images, sounds, scents, flavours, dances, rhythms, colors, suits and ornments. Invoked through static dances and three ceremonial drums (called rum, rumpi and lé), the African gods are incorporated in their `sons', making them to dramatize the great mythical facts and legends: the fight of the brothers Ogoun and Shango for the love of Oshum; the trip of Oshalufan for meeting his son, Shango; the love affairs of Oya… the entities are, at one time, psychic basis for human behaviors and mystic forces of Nature; and are represented in the rituals as sacred identities that are revealed inside of a mythical-liturgical structure of world interpretation. Therefore, It is not a matter theatrical mis en scène or histerical catharsis: in this mythical psychodrama there is an `energetic economy', where spiritual forces are manipulated and manipulate the bodies of the participants, in a choreographic spectacle that associates theme-images to certain rhythms. These audiovisual associations are a product and an instrument of a process of constructing a symbolic identity, according to the cultural tradition of each Candomble Nation and the invoked force-entity. One can notice in a quick comparison on the three nations that in the Voduns and the Inkices there are not only the same mystical forces that form the Ketu Orishas, but have also other forces and other concepts. In the case of the Jeje, existing in Haiti, Cuba and the Brazilian state of the Maranhão, there are more cultuated Voduns than the Orishas habitually most known in the Yoruba cult. The Voduns can be divided in man and woman; e, inside these division, into old or young people, leading to a total of forty entities. In the case of the Bantu rites, there is, due to a different conception about ancestry, entities proceeding from native brazilian mythology and also the presence of diverse types of spirits of deceasead people (caboclos, old black men, children, indians). In Africa, the nations were ethnic identities of different geographic groups. However, the term `nation' in the context of Brazilian candomble means a cultural group with intrinsic and specific traditions of cult. There is, therefore, a big difference between the ethnic identity of `African nations' and the cultural identity of ‘Candomble nations' in Brazil. Generality, we can say that the model `Jeje-Nago' is predominant in the Brazilian Candomble. It is the most traditional, and the least permeated by the cultural changes and influences, the closest to the original African model still existing in Nigeria. 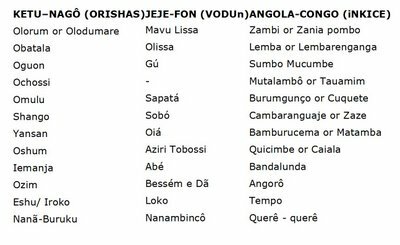 In opposition to this traditionalistic tendency of the Jeje-Nagô model, the Bantu cultural group (nations of Angola and the Congo) was the one that more mixed elements. The Bantus, even after a first moment of religious autonomy and although they preserved the original name of certain entities originally from Congo, gradually saw their rituals disaggregate, giving room to African-amerindian syncretism (Catimbó, Candomblé de Caboclo, Pajelança and the cult of native entities) and to the afro-spiritism (Jurema, Umbanda) or adapted to the rules dictated by the Nagô candomble, being distinguished only by the hymns, that mix Banto and Portuguese glorification to ‘Zambi’. Thus, if the Candomble is a manifestation of the cultural identity of the black people in Brazil, one can easily notice the existence of a Angolan line in opposition to a Nago line of development. The first one, incorporating the native and mixed ancestry, is responsible for new forms of social identity inside Brazilian reality; otherwise, the second, in contrast, serching more and more to africanize itself, evokes exclusively the orishas and keep the ceremonies with the spirit of the deceased (or ancestors) restricted to the secret rites of the ‘Sociedade dos Eguns Ilê Agbouça’, in the island of Itaparica (BA). Besides these cultural variations of the symbolic references according to the nations - that, in Brazil, are diversified in thousand of sects and multi-syncretized cults under the Jeje-Nago hegemony – there is, still, a symbolic variation reffering to each entity inside the same ritual, where the references are organized in order to characterize the identity of each orisha. Each `Santo' has its color, its musics, its dance and, at the same time, it corresponds to a specific type of human behavior and to a vibratory band of Nature. Each entity is a beam of symbolic references. In the Xireé, the sequential order of presentation during the ritual is when one can better observe how the Orishas form the net frequencies of Candomblé as a symbolic language: in the beginning the more ctnonic and dense vibrations; in the end, the most distant and less material vibrations. It is a matter, as we said, of reuniting the Ayé (World of black and red) to the Orum (luminous universe of the white), passing through every specter of intermediate vibrations/entity. The Jeje-Nagô or Bahian model presents, generally, sixteen main orishas: Eshu, Ogoun, Ochossi, Ozaim, Shango, Yansan, Oshum, Obá, Nanã Buruku, Omulu, Ochumare, Iroko, Ibeji, Logunedé, Iemanjá and Obatalá. Let’s see now how the symbolic references (alimentary and audiovisuais) of these sixteen entities are organized in the vaticination system of the Ifá. Even it being a process where the identity is predominantly produced by rhythmic and chromatic frequencies, the Candomblé is not only a set of audiovisual references, but also of taste, scent and touch references, (the food, incenses and herbs). Actually, these kinaesthetic references literally `feed' the audiovisual frequencies, through offerings and sacrifices, the symbolic language need to be nourished from psychic energy, the Ase. The ritualistic process in which a material body is bonded to the energy of one determined orisha, is called ‘assentamento'. By reduction, the term is used also to refer to objects (ritualísticos rocks, amulets, instruments) that represent each orisha, after a ritual where the mystic energy of the entity is concentrated on their bodies. The most common fetish is `otá' (rock). It is dived in liquids and substances, kept in small bottles (‘quartinhas’) closed with colored cloths with embroidered symbols, depending on the orisha. The most common liquids are the honey, dendê oil and water macerated with the herb of the saint. Waters from different procedence are required: water of the sea, from the rivers, rain, etc., the liquids or `Abós' are ritualistically prepared with drops of animal blood and secret chants that only the Babalorixás know. There are cases, however, as in the ‘water of Shango, that the beverage is prepared with a `lightenning rock' (meteorite), where it is the otá that magnetizes the liquid from the ‘quartinha’. All ‘assentamentos’ are periodically fed from sacrifices and characteristic offerings for each entity, thus the entities get again the energy of its specific Ase. This energy is stored in the central points of the ‘terreiro’ and it is used to dinamize new ritualistic objects or to the entities to manifest on their ‘children’. Thus, for extension, the term `assentamento' also is a mention to the basic rock of the ‘terreiro’ (where, on the occasion of the inauguration diverse objects reffering to the saint of the house are embedded) and to the process of ritual initiation of a ‘son’ (Iaô), to assign the moment where the mystic force of the orisha is fixed in the head of a devotee. We have, therefore, three distinct types of ‘assentamento’ and three spheres of energy feedback. Every traditional Candomblés have the “assentamento’ of the house, pertaining to the Orisha to whom the place of fetichism is dedicated. These nestings are embedded on the occasion of the inauguration ceremony, in the basic rock of the house or under the `Ixé', a central mast where the flag with the graphical symbols of the chosen orisha stands. In the entrance of every ‘terreiro’, usually there is a white ‘Gameleira’, a tree consecrated to Iroko (the Time), that it is planted according to prescribed rituals and also must be considered a ‘assentamento’ of the house. This orisha responds for the climatic and meteorological changes, and it is a sort of guardian of the terreiro. When there are other natural forces in the place (waterfalls, rivers, quarries, etc.) 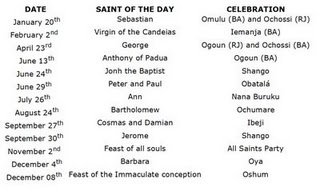 one can also have specific ‘assentamentos’ for the corresponding orishas. Generally, these nestings are fed in the annual Ossé - that is a great party for cleanning the altar and whole terreiro, when ritualistic food is specially served for every orishas - and in the public parties of each one the saints, according to the traditional liturgical catholic calendar. Despite the half-matriarcal character of the African cultures, the original liturgical calendar of Candomblé was marked by the advent of the four climatic seasons, with the solstice of winter (June) dedicated to the main masculine orishas (Ogoun, Shango, Obatalá) and the solstice of summer (December) consecrated to feminine orishas (Oya, Oshum, Iemanja). There never had been a single calendar for the cult of the orishas. In Brazil, the fiscalization of the farms administrators where the African slaves worked and the general repression to the cults of candomblé made the black people to adapt, so they linked their ritualistic parties to the catholic ceremonies. There is, still. in the scope of the ‘terreiro’: the ‘tronqueira’, ‘assentamento’ for the protective Eshu of the house, and the Ilê-Saim, the house of the deceased (eguns) that are still identified with the material life. These nestings, that are always out of the area consecrated to the orishas, are not fed annually, but according to the lunar cycle of 28 days and the daily cycle of the tides. In candomblé, the Eshu is the entity that presents the densest frequency of the specter (red and black), and it is the only one capable of establishing a link between men and the orishas. Therefore, he is requested to initiate every ritual operations of the cult. Each orisha has its proper Eshus, that work as servants or messengers, making possible the contact with the other entities. Therefore, before any offering for the saints, always a sacrifice to the corresponding Eshu has to be made. The objective of these sacrifices is to keep the Ase of the ‘assentamento’ - the mystic force of the orishas – operating. The blood, together with alcohol and sexuality, are material vehicles that discharge the indispensable vibrations to the Eshus and to the deceasead in general to act in the material plan, and also, in the inverse direction, to men to penetrate in other states of perception and conscience. The ‘assentamento’ of a orisha in a human being is carried out through a ceremonial process called `initiation'. These processes are carried on by obligations, and individual offerings of each initiate to their tutor orishas or to an entity with which they are momentarily disharmonized. Besides the annual ceremonies of the liturgical calendar, it exists one day of the week consecrated to each orisha, that can be used for delivering of individual obligations, made of food offerings and the accomplishment of animal sacrifices. The alimentary restrictions also symbolically condition this permanent identity between men and gods: the prohibitions consist on not consuming the substances that vibrate in the same frequency as the saint with whom one is identified. Just in the initiation process these substances are ritualistically ingested. After this period, the characteristic food of each orisha are interdicted to its devotee. If the individual do not obey these alimentary restrictions he is submited to, he may carry on a `symbolic self-anthropophagy', suffering then the ‘quizilas’ (mourning sensation, malaise). For the same reason - the maintenance of the psychic identity between the Orisha and the initiate - the marriages between children of one same saint were considered incestuous. In Africa, since candomblés are trully ethnic identities and there are real bows of kinship between the groups that cultuate the same entity, this prohibition had a genetic meaning, that go further than the cultural and inter-subjective meanings. But one should not think that men are prisoners of a fixed behavior, mere passive instruments of gods: “the saint is also possessed by its children”, they have an active role, being a part of a complex relation between orishas and the community, multiplying the relations between the entities. The speech of the initiates clearly translates this reciprocity. The same way one can speak about ‘his’ saint, also there are comments on `being the saint': “the Shango of someone is rebellious”; and inversely: “that one is the Ogoun of the house”. That is: at the same time that the divinities are properties of their children, the initiates are also properties of the orishas with whom they are identified. Thus, it occurs a constant game of exchanges between the concrete individual and the abstract principle it manifests. Thre is, therefore, a very dinamic symbolic reciprocity between the entity and the person. And it is this reciprocity that is simultaneously developed in three levels - the annual cycle for `firming' the house, the monthly cycle of energy feedback of fetishes and abôs, and the weekly cycle of the individual obligations decurrent of the initiation. And this last cycle, however, ended up simplifying all the multiple and wild system of the Ifá in a system of seven main vibrations. Today the foods and plants are no longer classified according to their places in the mythical space/ time, but in relation to the vibratory bands of a body turned universal. The passage from the multiple, wild and territorial system of the Orishas in the Candomblé to the seven lines of Umbanda follows a way of framing and synthesis of the frequencies in the western model of correspondence, as in the case of the seven days of the week, in detriment of the local dates and territoriality. Thus the whole liturgical structure of the cult to orixás in candomblé can be summarized as the process of, ritualistically, accumulate, and then to transmit, Asé for the Iaôs in three levels: the annual cycle of the `firming' of the house, the monthly cycle of energy feedback of fetiches and abôs, and the daily cycle of individual obligations decurrent from the initiation. In the center of all these relations that compose `the energetic economy' of candomblé is Ifá (Orunmilá), the Orisha of the Destiny. The more common oracle is constituted by l6 Búzios (small shells). The pai-de-santo agitates the Búzios in his hands and launches them inside a circle, formed by diverse necklaces from the orishas. The búzio can fall `open' or `closed', that is, facing where it has a crack or with the smooth side. Each one of these `falls' is a manifestation of one orisha and it has one specific meaning, once, according to the resultant ordinance, one can determine which of the Orishas is answering. Every aspect of life is susceptible of codification by each one of the orishas that are disclosed in the game. The gods, then, become the principle of classification of the events: each one governs a type-event. Besides the ordinance of the Búzios (open and closed), that determines the entity that presides over each answer, the configuration - or the particular way as the Búzios get distributed geometrically in the space – is also fundamental for comprehension, therefore corresponds to the ‘energetic organization’ of the unconscious of the individual before a matrix force. The set of the two factors, ordinance and configuration, is called odú or fate. The System of Ifá, even being so contested by posterior researchers, relation collected and presented for Roger Bastide and Pierre Verger, today is used and until cited for some cartomances as being the traditional one. 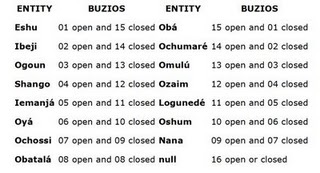 This way, the open-closed ordinance determines which Orisha is speaking and the space configuration of the Búzioses indicates what it is saying. Through successive trows, one comes, then, to a kind of inventory of what it is happening to the person, not only in relation to his tutor Orishas, `the owners of their heads', but also as other entities are influencing positively or negatively in his life, what are its recurrent tendencies and the possibilities before destiny. Generally services and obligations for energetic balance are considered. The answers are deciphered through the legends and stories of the gods - that are transmitted from generation to generation through oral tradition. Therefore, `to play búzios' not only requires sufficient intuition to interpret the different configurations formed for the force-matrices, but also oral knowledge of the set of the mythical tradition of the Orishas and their symbolic universe. The priest of Ifá was, originarily, call of Babalawo. They were the oral historians of the African culture. Their initiation was much more complex than the others, therefore did not involve the identification with only one archtype and the development of its characteristics in the personality of initiate, but actually the learning of centuries of knowledge stored by the cult. Today the ‘zeladores de santo’ (saint keepers) in general menage the oracle. By the way, two contemporary perspectives are today developed: the rescue of the symbolic patrimony of candomblé and the re-invention of the traditions by the Umbanda. The rescue of the traditional symbolism of candomblé, gained great impulse in 90´s, with research and reconstitution of histories and mythical legends, as well and mainly of the proper system of the Ifá. 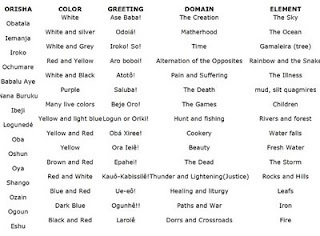 And, as we saw, it is in the Xireé, and the sequential order of presentation during the ritual, when better one can observe how the Orishas form the net frequencies of the Candomblé while symbolic language: each entity is a beam of symbolic references, each orisha has its color, its music, its dance and, at the same time, it corresponds to a specific type of human behavior and to a vibratory band of Nature. The Umbanda, on its turn, adopts the musical scale of seven and the chromatic specter of the light in the rainbow: the seven lines of umbanda, where they fit, in different platforms, every Orisha, messenger, energy. There is a transformation of the symbolic-genetic identities into cultural-symbolic identities. It is the system of classification of the alimentary and audiovisual references of the Orishas (the Ifá) transformed into system of classification of psychological references of the personality. The Asé was personalized and Orishas had gradually become masks, types of people and/or psychological aspects of the personality, not only of the living creature but also of the deceased. But there is different levels of application of these criteria. In some centers that work with both Umbanda and Candomblé ('Nation'), one usually says that "a Orisha does not incorporate, irradiates". However, when dealing with the Orisha Ibeji and the 'children' of Umbanda the difference is only conceptual. By the way, to many the 'state of erê' it is more a period of the trance than a specific frequency. The same can also be said about the ‘old black men’ and orishas more aged such as Nana, Oxaguiã, Omulú. These experiences of the trance leads us more towards Jung’s archtypes of 'inner child’ and of 'old wise men' (elements of dramatization of the different moments of life) than properly of different combinations of the psychological aspects of the personality. There is also many possible interpretations and analogies between the astrological language and the Ifá, as one that compares the head orisha with the solar sign and associate orisha as the ascending sign, or secondary aspect of the personality. 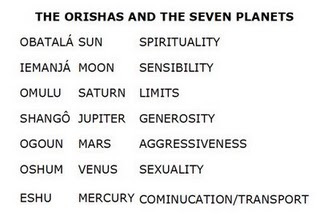 Others prefer to read orishas as planets and the aspects as the mythical relations between them.